First Churches’ sanctuary a delight to the eye, ear and heart. The 1878 building is one of the finest examples of High Victorian Gothic Church architecture. When entering from Main Street on a sunny day, you are greeted by golden light reflected in the stained glass windows on warm, cherry wood pews. Excellent acoustics make this a popular venue for musical concerts. The grand Skinner organ was presented to the congregation in 1936 at the time of the churches 275th anniversary. It is perfect for wedding processionals! Vaulted arches and high ceilings contribute to a sacred and expansive atmosphere. The sanctuary also hosts a wall plaque tribute to renowned theologian, Jonathan Edwards, who was the third pastor of the church from 1727-1750. 600 guests can be comfortably accommodated and the sloped floor allows everyone a great point of view. 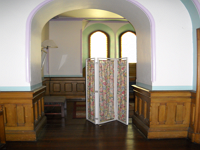 There is a sitting/ dressing area off the vestibule. This is a relaxing area for the Bride and her attendants to retreat before the processional. A private entrance allows the Bride can enter the church separately from wedding guests. There is also a handicap accessible ramp on Center Street. We extend our hospitality and our Sanctuary to all weddings. Interfaith ceremonies and all religious services are welcome. You may invite a clergy person from outside of First Churches to perform your wedding or you may choose to have your ceremony officiated by Rev. Weir. The church organist is available to perform your choice of music or to help you select music for your special day. The church sexton serves as an attendant and to assist with the set up and clean up. Unfortunately we cannot allow, rice, balloons, candles or animals inside the sanctuary.